We live in a time when people are becoming increasingly vindictive. Their morals are deteriorating and their minds are darkened. The absurdity that people are experiencing today is obvious and undeniable. We’re living in a time prophesied by Anthony the Great when people who are mad appear to be rational and those who are rational are deemed mad. It may be claimed that in older times, too, there was rampant sinfulness, but we ought to note that there was never this offensive legitimation and widespread social acceptance of sin. In our time, abortions, adultery and homosexuality have all been made legal, though this would have been inconceivable until the middle of the 20th century. It’s a cause of astonishment, if nothing else, that today sin is projected not simply as legitimate, but as an ideal way of life. Today the family is undergoing a great crisis throughout the world. The eternal enemy of mankind knows very well that if he strikes at the core of society, which is the family, he’ll achieve his goal. He’s created conditions such that young people avoid or delay getting married, and naturally with no thought to what should go without saying -- chastity and a life in Christ. They don’t have a Church wedding, which is the only valid and blessed marriage in the sight of God. They have a civil wedding or that modern, demonic agreement to live together, by which even homosexuals can marry. And even in existing families, he’s created temptations out of nothing, so that divorce presents itself very easily as the ideal solution! 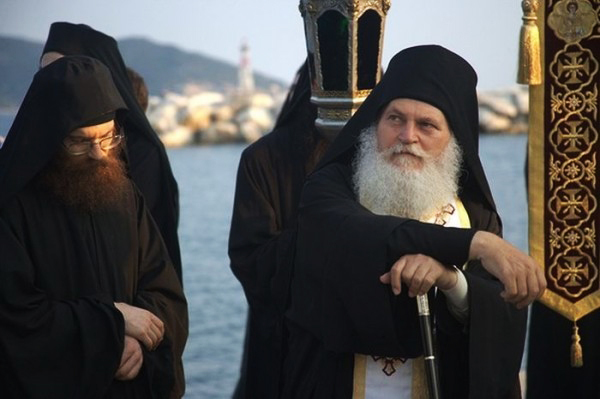 The statistics from dioceses in the Church of Greece indicate that in any year there are more divorces than weddings. We understand the temptations and challenges of our day, which offer carnal pleasure to people all too easily. Pre-marital and extra-marital relationships are deemed to be normal, whereas in fact, they’re unnatural. In this way, the proper conditions and the sacrament of marriage itself are trampled upon. Chastity before marriage and fidelity and mature restraint within it aren’t the result of applying some sort of moralistic commandment of God but have an ontological dimension. ‘Because of this, a man will leave his father and mother and cleave to his wife and they shall be one flesh’ (Gen. 2, 24). When a couple enjoys conjugal relations within marriage, they’re one, they experience real unity and love, blessed by God. Every pre-marital or extra-marital relationship, however, splits the personality. And the natural fruit of these sinful relationships is unwanted pregnancies, which, of course, lead to abortions. At the same time, the economic crisis, which has begun to assume global proportions, is another reason which causes couples to have an abortion. The financial difficulties faced by the household seem to be an inhibiting factor as regards raising another child, and so they have recourse to abortion. A huge mistake! People aren’t the sole creators in the birth of children but work together with God the Creator. God knows and has the power to look after His creatures a lot better than we do. Look how Christ Himself gently mocks us, in a way, for not trusting in His providence: ‘Are not two sparrows sold for a penny? And not one of them will fall to the ground unless your Father knows. Even the hairs of your head are all numbered. Do not be afraid, then; you are worth more than many sparrows’ (Matt. 10, 29-31). If He cares for the sparrows, won’t He care for people, who’ve been made in His own image? We’ve lost our faith today, not so much faith in the Triune God, that’s to say dogmatic faith, but faith in God’s providence, our trust in God. We’ve got to become surer in that faith and we have to ask for it from God. When the Apostles asked Christ to add to their faith (Lk. 17, 5) it was this faith that they meant. Every year, throughout the world, there are about 50 million abortions. It’s as if we killed the whole population of France. Greece, unfortunately, occupies the first place in Europe, with more than 300,000 abortions every year, with 22% of Greek women having had at least one. In Russia, in recent years, the number of abortions has exceeded 1 million per year, with a world record in 1990 of 4,103,400. And, of course, in reality, these figures and percentages are much higher, because most women don’t go to public hospitals for an abortion, since they’ll definitely be registered, but prefer private clinics, where records aren’t necessarily kept. These numbers don’t include the ‘test tube abortions’, which are also very high and arise from IVF procedures, when there are many more eggs fertilized than those which will be implanted or used; abortions for ‘genetic experiments’ which are undertaken for a variety of purposes; and abortions of twins or triplets so that a single child is born. There are many people who claim that the demographic problem that Greece, in particular, is facing, as is Russia, also, will be the greatest problem of the next decade since deaths are already more numerous than births. The main problem is not the low birth rate (though this, of course, does exist), but more the fact that abortions are a new form of genocide. Already there are more abortions in Greece than births- almost three times as many! It’s within this context that this Conference is being held for the fifth consecutive year and we hope that it’ll bear fruit a hundredfold, that it will provide information to all prospective parents, to all women, to make the leadership of the Church and State aware, so that abortions can be avoided or reduced in number in your country and throughout the whole world. Amen.